A catalyst is a material of constant composition, which accelerates the rate of a chemical reaction by providing a suitable reaction pathway with the lowest activation energy. As the activation energy is lower, more reaction products are formed in the same period of time. Most catalytic reactions encountered in hydrocarbon processing are carried out with porous catalysts to provide a sufficient surface area for the metal dispersion and the ensuing reaction. These catalysts gradually lose their catalytic activity, usually through structural changes, poisoning, or the deposit of extraneous material. A catalyst which can no longer exhibit the necessary activity and/or is specificity required by the user is referred to as a “spent catalyst”. Catalysts are critical to the chemical industry and are now used in most industrial chemical processes. Along with the rapid development and wide application of catalysis technology, the amounts of different spent catalysts are increased from year to year. The physical properties of spent catalysts, as well as their composition, are generally different from those of fresh catalysts. For example, spent hydrotreating catalysts contain metal sulfides and coke, and may have additional contaminants that were not present in the fresh catalyst. Catalyst regeneration involves the processing of spent catalysts in order to make them reusable. This is done by restoring the initial properties of spent catalysts and thus restoring their efficiency through a process called regeneration of catalysts. Traditional methods of vapor-air regeneration are energy-consuming and severely limit the number of regeneration cycles. Using supercritical fluid CO2-extraction process, according to some estimates, provides a two-fold energy savings and an increasing number of regeneration cycles possible. 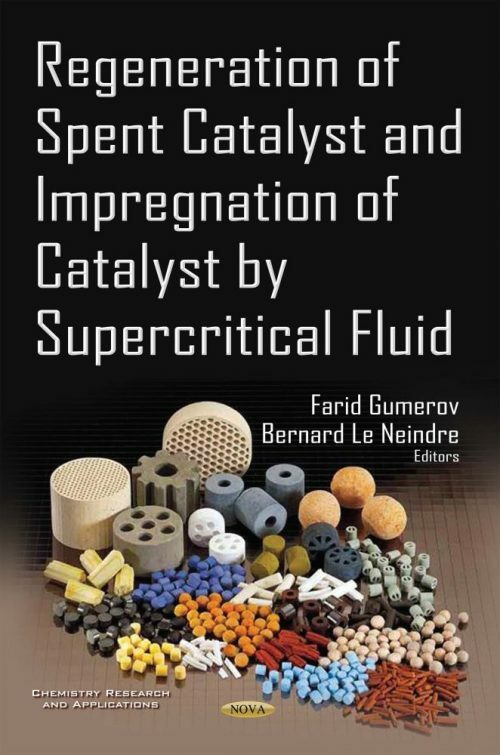 This book gathers a series of studies describing new methods for the regeneration of heterogeneous catalysts for important industrial chemical processes. In this book we propose new extraction techniques using supercritical fluid extraction (SFC), which seems to be one of the most promising as a green reaction medium. The feasibility of using supercritical fluid СО2 extraction process was investigated in particular for spent catalyst regeneration. The low regeneration temperature of supercritical carbon dioxide eliminates the risk of thermal deterioration of the catalyst (namely the collapse of the pores), prevents the reduction of the surface area and the sintering, and allows regeneration of catalysts with an activity close to that of fresh catalysts. The results of the implementation of the supercritical fluid СО2 extraction process with respect to samples of industrial deactivated catalysts are provided. A comparison of the characteristics of the regenerated catalyst samples by traditional approaches and the SC-CO2 extraction process is carried out. The possibility of using a supercritical fluid CO2 impregnation technique in the synthesis of a palladium catalyst is also studied.